A team of scientists led by Dr. Michel Desjardins from the University of Montreal and Dr. Heidi McBride from the Montreal Neurological Institute and Hospital (MNI) at McGill University have discovered that two genes associated with Parkinson's disease (PD) are key regulators of the immune system, providing direct evidence linking Parkinson's to autoimmune disease. Using both cellular and mouse models, the team has shown that proteins produced by the two genes, known as PINK1 and Parkin, are required to prevent cells from being detected and attacked by the immune system. When PINK1 and Parkin are dysfunctional, as is the case in a subset of Parkinson’s patients, cells display small parts of proteins at their surface, known as antigens, derived from mitochondria. The presence of these antigens at the cell surface causes the activation of immune cells called lymphocyte T cells. These T cells, which can enter the brain, have the ability to destroy any cell displaying the mitochondrial antigens on their surface. Parkinson’s is caused by the death of dopamine-producing neurons in the brain. An overactive immune system due to dysfunctional PINK1 and Parkin genes could explain why dopaminergic neurons die in Parkinson’s patients. This indicates that Parkinson’s may be one of many autoimmune diseases, including multiple sclerosis, Type 1 diabetes, rheumatoid arthritis, and lupus. An autoimmune disease is one in which the body’s own immune system attacks healthy cells. Researchers suspected that mitochondria, organelles within cells that are responsible for the production of energy and other metabolites, play a role in Parkinson’s. It was widely believed that mitochondria become damaged in Parkinson’s patients, creating a toxic build-up of broken mitochondria that eventually leads to neuron cell death. However, it has been difficult to provide evidence that this is effectively happening in animal models. The new findings of the Desjardins/McBride teams linking PD to autoimmune mechanisms, published in the prestigious journal Cell on June 23, have been validated in a mouse model of Parkinson's disease where PINK1 or Parkin are absent. “Clinicians have shown that the immune system is activated in the brain of PD patients,” says Dr. Diana Matheoud, a postdoctoral fellow from the University of Montreal and the article’s first author. “Our study explains how an attack by the immune system may be responsible for the destruction of dopaminergic neurons during the disease. We are currently testing whether autoimmune mechanisms lead to the loss of dopaminergic neurons in mice, and developing systems to extend our study to human neurons." Now that a link has been established between two key genes involved in the pathology of Parkinson’s disease and autoimmune mechanisms, the next step is to develop drugs that can limit the presentation of mitochondrial antigens. Remarkably, the mechanism by which mitochondrial antigens are presented involves a process of vesicle formation, originally described by the McBride group, offering molecular targets for the development of new drugs in an effort to block this process. This research was funded with the help of the Canadian Institute for Health Research and the Canadian Research Chairs program of Canada. 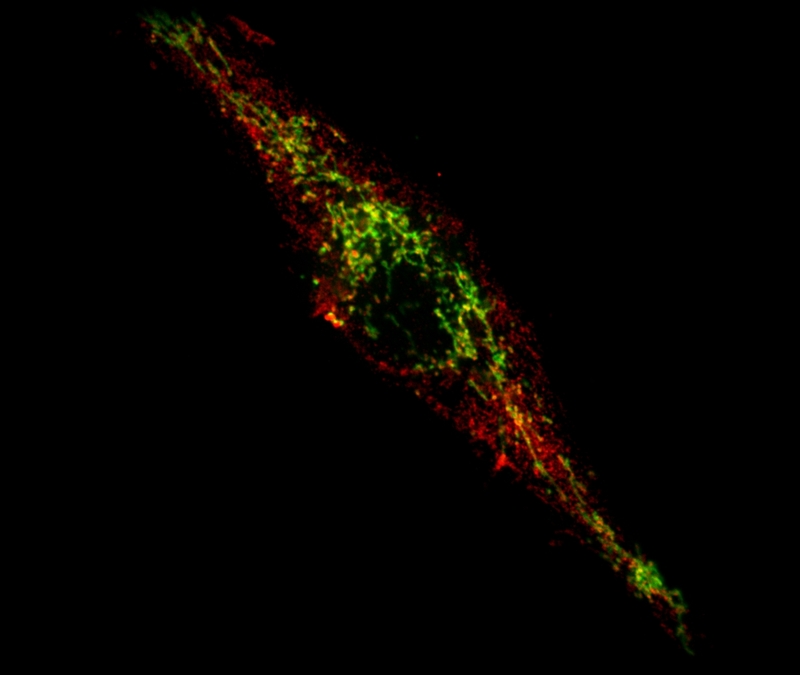 Image Caption: A cell where the Parkinson's disease-related protein PINK1 is absent is in the process of presenting mitochondrial antigens (in red) at its surface to alert the immune system. Intact mitochondria are observed as rod-like structures in green.